Do you know how to use it or it's? Here is an overview along with some great printables for your students. Using its or it's correctly is one of those common mistakes I see everywhere. There is a relatively simple rule of thumb for understanding when to use it's and when to use its. Everytime you see it's, ask yourself if it can be replaced with it is or it has. If it can, you will always use it's. 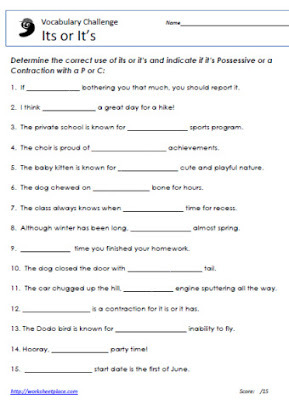 The version of it's with an apostrophe is really a short form (contraction) for it is or it has. 3. The team was on time but its captain wasn't. (You can't say but it is captain wasn't. When using its without the apostrophe, you'll notice that there is a sense of belonging and that the its can't be replaced easily with it is or it has. If you can remember this, you'll never have another problem understanding the difference between it's or its. 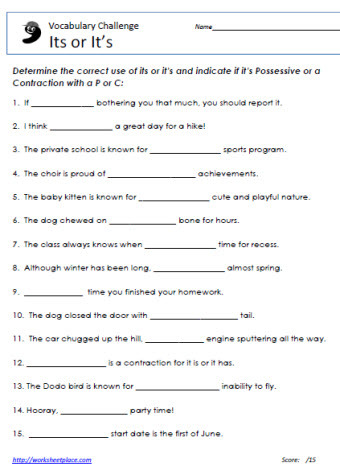 Are you ready for a few it's or its worksheets? You'll find 15 exercises on each page with the answers on the second page.